You wouldn't believe the age once you see this. I never had any problems with my vehicle. It is a 100% gas saver (15 gal), it hardly ever had to service it, parts are extremely cheap, it has a cold air intake, brand new exhaust system, cherry burlwood dash/interior trim kit to give it that fancy look, and it has a $1300 capacitive touchscreen car play stereo along with brand new jbl speakers: 6 1/2 front and 6 3/4 back. To say it is a 2006 vehicle, it sure looks like a 2016 minimum. It is a black sleek car with convertible. I love my car. It is black and fast. It has very low mileage. It drives like new. People look at my car all the time. It has great radio system. I love to take it for long drives on Sunday. It is a convertible so I love to put the top down. I just put on brand new tires so it hugs the road. The super amazing 350z car. I just recently got my 350z I absolutely love it so far no problem. It's a well maintained car it has over 240 thousand miles and purrs like a kitten. Its real comfy has all the extras. The only problem is the wiring sometimes when you turn car it changes channels. 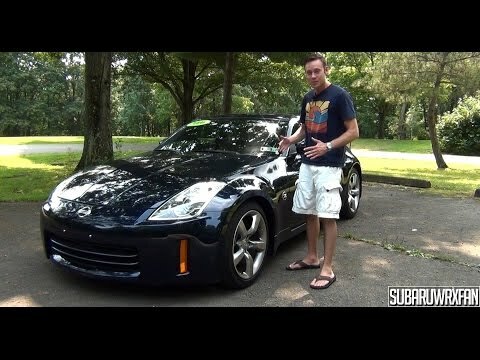 NISSAN 350Z CAR REVIEW! - Pure Driver Engagement!